The Fiat’s brand Chrysler unveiled its newly designed minivan Chrysler Pacifica 2017. The model gets really gorgeous looks and has an interior that will make your ride a smarter experience. Not only had these but even beneath the hood company placed better powertrain options including a Hybrid engine. 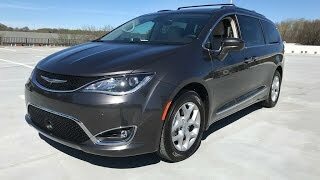 Let us have a look at the review of Chrysler Pacifica 2017 to know in detail about it. The interior of Chrysler Pacifica 2017 is a mile ahead of what we usually see in a minivan. Inside you’ll notice the Stow ‘n’ Go seats mounted while the second row seats can be bend and slid to make the entry easier. For the driver there is leather wrapped high-end steering wheel hiding behind it a full color TFT display featuring all the vital information required. A pair of 10-inch touchscreens is available for your entertainment while the six-speaker system with Active Noise Cancellation comes standard with the model. Talking about the features there is keyless Enter ‘n Go system with push-button starting. You can now slide open the doors without using hand while the rear liftgate comes with notable kick under the door feature. 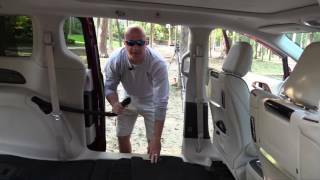 Thus rounding up the interior details of Chrysler Pacifica 2017 I would say, it is luxurious, tech oriented and spacious. 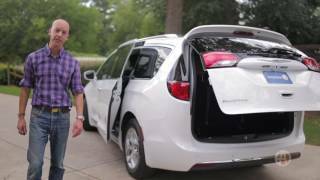 The exterior of Chrysler Pacifica 2017 will break all your traditional notions about a minivan. Starting with the front fascia you can find hints of sedan 200 by the company. The essence can primarily be felt over the front grille which features sharp chrome lines while the projector beam headlights with LED daytime running lights join the league commendably. The front section has swept chrome accents and body lines moving towards the back, making this model unique and lap ahead of what other minivans offer. At the rear corner things remain bit confined yet the model doesn’t loses its elegant feel. The taillights get a new design while the trunk lid remains simple, featuring traits of a family car. 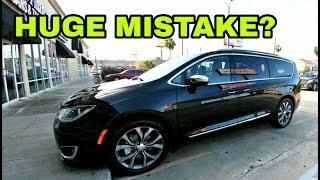 Thus rounding up the exterior details of Chrysler Pacifica 2017 I would say, it is elegant and brings some really new gorgeous inclusions to steal the gleam. Beneath the hood of Chrysler Pacifica 2017 is a 3.6 liter V6 engine generating total output of 287 hp and peak torque of 355 nm mating to six-speed automatic transmission. 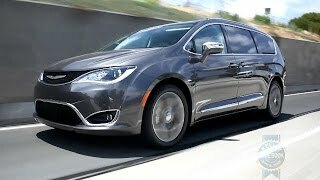 The performance figures of Chrysler Pacifica 2017 are still not shared however we do know that the model will also bring a hybrid drivetrain. The latter will include a 16 kW battery.